Sep 19, 2011 · Are you a fan of Game Of Thrones? Check this out: http://amzn.to/1rvwpPw. 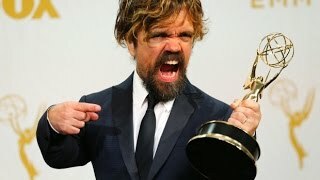 Sep 18, 2011 · Game of Thrones’ first award on Sunday's night's Primetime Emmy awards show went to Peter Dinklage for Best Supporting Actor in a Drama Series. Emmy Awards; Primetime Emmys Show; ... 2011. Winner; Peter Dinklage, ... Lena Headey and Peter Dinklage of Game of Thrones at the 66th Emmy Awards. Sep 18, 2011 · Dinklage is the first LP to win an Emmy. For HBO's "Game of Thrones." Aaron Paul wins an Emmy for Breaking Bad at the 2012 Primetime Emmy Awards!